One of the nation’s premier Aboriginal art and cultural events, Desert Mob, opened in Alice Springs on Thursday 8 September. Desert Mob was instituted by the Araluen Arts Centre in 1991 in order to promote Aboriginal artists and their art centres from Central Australia to broad audiences, stimulate the art market for Central Australian Aboriginal art, and to place artists and art centres in the spotlight. 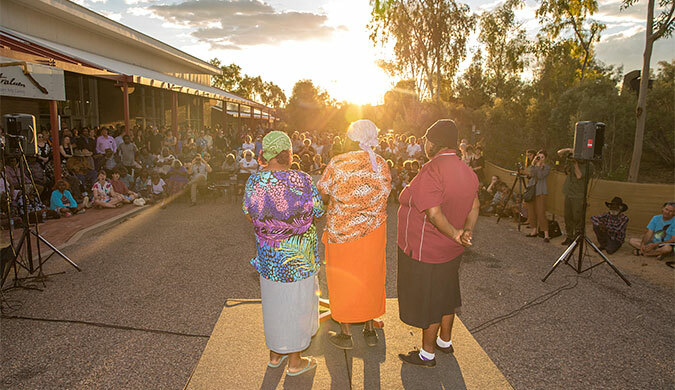 Now in its 26th year and with partner Desart, the event has grown to include a Symposium with presentations from artists and arts-workers across the Desert region and an affordable Market Place that had people lining up in anticipation for a couple of hours in order to acquire their own piece of Aboriginal desert art. Desert Mob 2016 continues the tradition of presenting new, vibrant and experimental works by emerging and established artists from Desart member art centres across the NT, SA and WA. The Desert Mob 2016 exhibition will be open until 23 October this year and spans three galleries, presenting over 250 artworks by 295 artists from 31 remote arts centre, including paintings, ceramics, photography, sculpture and installation works. For further information please visit Araluen Arts Centre. Desert Mob 2016 opening. Photo by Lisa Hatzimihail. Courtesy of Araluen Arts Centre.